This isn’t a miraculous occurrence or a trick. But it is very rare. Under normal circumstances, a hen ovulates and releases an oocyte that travels through the oviduct forming the yoke. It collects layers of membranes and albumen along its way through the reproductive track and develops its white. Finally, it forms the shell in the uterus. 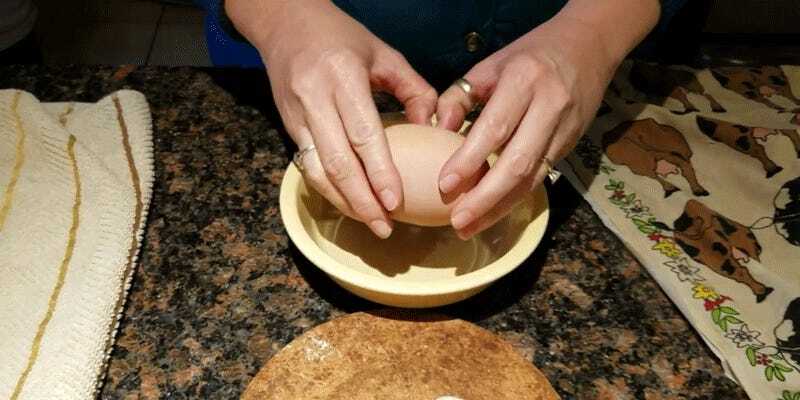 But in rare circumstances, another ovulation occurs before the first egg is fully formed and the first egg is sucked back up into the beginning stage of the oviduct. This second egg forms itself through through the usual process and just makes room to encapsulate the first egg. Next thing you know, a very large egg is pushed through the cloaca. The YouTuber that uploaded this video writes that his hen is fine but they were afraid to eat the egg. For the record, if this once in a lifetime occurrence happens to you, both eggs should be normal.